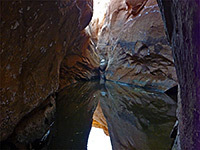 Trachyte Creek has about a dozen east-side tributaries, most forming slots, though there are no extended narrow canyons here, just short enclosed stretches between longer open sections. 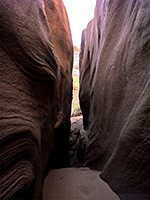 Access is more difficult than for the fewer west-side branches because this area is further from a road; the high cliffs of North Wash prevent any access from the east, so the approach is either by driving along a sandy track towards Trachyte Point, or by walking eastwards from Hwy 276. 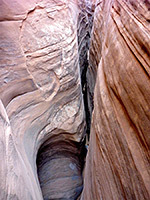 One slot that although short (800 feet) is deep, colorful and enclosed by nicely shaped rock walls, is formed by the adjacent drainage on the north side of Trachyte Point Canyon (aka Witches Cauldron), and is known to some people as Munchkin Canyon. 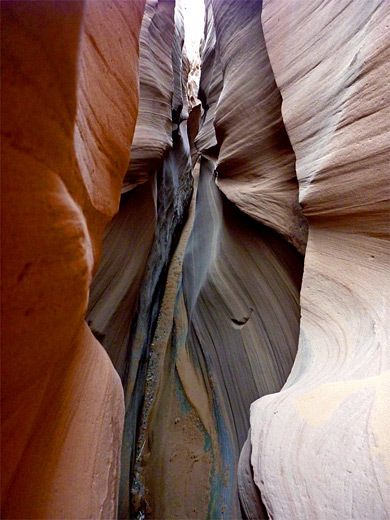 The two are usually visited on a loop hike. Topographic map of the Trachyte Point area. The lower end of the canyon can be reached by parking beside Maidenwater Springs on Hwy 276 and walking cross country for nearly 3 miles, initially north, into the upper end of a ravine, then following this downstream (east) until it meets Trachyte Creek. Closer access is provided by a narrow track, sandy and/or rough in a few places, that meets Hwy 276 between mileposts 4 and 3 and heads southeast to the high land of Trachyte Point. 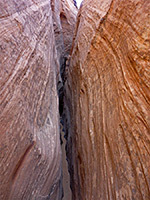 A suitable parking area is after 4 miles, on the mesa at the head of the canyon. The main slot is then 1.5 miles downstream. 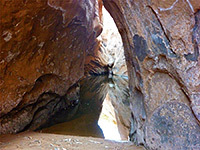 If approaching from the west, North Trachyte Point Canyon meets Trachyte Creek right opposite the mouth of the entry ravine. The lower end contains bushes and cottonwood trees but is not too overgrown, and walking is easy, along a bench and sandy mounds on the north side. Cliffs rise to the south, leading to the first little slot, which is followed by a semi-permanent pool, a chokestone and a short twisty passage, not really worth the effort trying to enter. After another open stretch, a tributary joins from the north, just below a dryfall and confined channel, though the proper slot is not for another quarter of a mile. 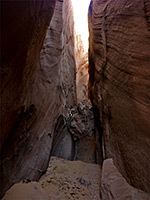 This is much deeper, and in places too narrow to explore at floor level, instead requiring stemming quite high above. Some parts are winding, with sharp S-bends, while other sections are perfectly straight. 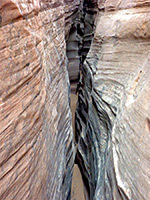 The slot gains height at the upper end, and beyond a dryfall the canyon is wide and sandy. 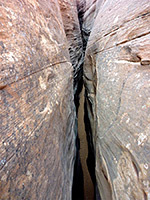 Big slickrock slopes enclose the valley, especially on the south side, where the land rises 400 feet to the top of the ridge separating the canyon from the larger drainage to the south (Trachyte Point Canyon).